The 340 Weatherby Magnum is a proprietary rifle cartridge designed by Roy Weatherby in 1963 as direct competition to the 338 Winchester magnum. The 340 Weatherby uses a 300 H&H magnum case as its parent case, necked up to accept the large caliber round. The goal of the 340 Weatherby Magnum was to utilize the same bullet as the 338 Winchester Magnum, but at a higher velocity than the Winchester counterpart. Accordingly, the 340 Weatherby Magnum has some impressive ballistics and is able to propel a 250 grain projectile at 2,950 feet per second. 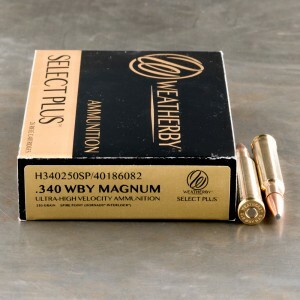 340 Weatherby ammo is an excellent hunting round at long ranges. The round is known for its ability to take clean kills from large deer species, bear, and of nearly any other game in North America. The 340 Weatherby magnum does feature sharp recoil, exceptionally loud blast and harsh concussion. Because of this, the round should be used by those with the proper experience levels to maximize safety.